The account is pretty harmless so far but do you mind blocking/reporting it for me? EDIT: I don’t know if it’s harmless since the account is private, don’t know what the person behind it is up to :(. The info and the picture clearly came from this blog. Well, at least now I know somebody reads. HOWEVER, I’m not encouraging! Intention is unclear but I was alarmed by the unauthorized change of my FB password just a while ago. Not saying both incidents are connected but just to be more secure of my accounts, I’m putting down my Facebook link on this blog. 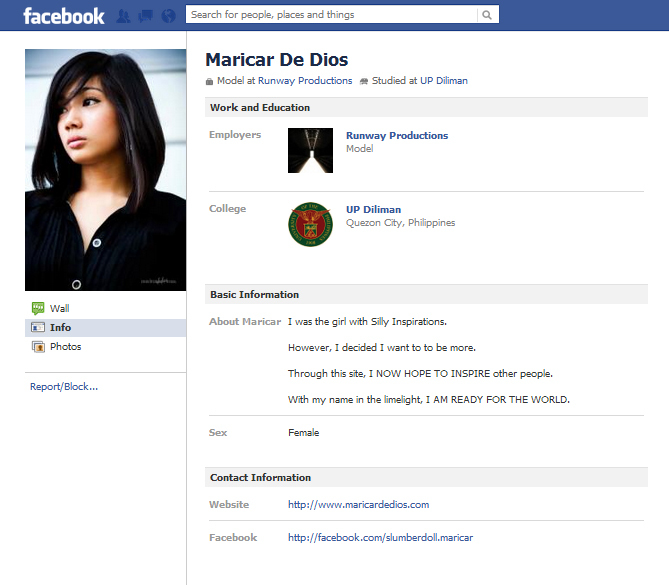 This entry was posted on July 12, 2012 by Maricar de Dios. It was filed under Personal and was tagged with Facebook. oh, she must be a fan but this is not a nice thing to do.